My love for Laphroaig is no secret, but the levels of admiration vary between malts. For instance, I thoroughly enjoy the new Laphroaig Lore with its sherried richness. On the other hand, Laphroaig Select comes across as a touch anemic for my tastes. Its signature peaty character didnt shine through. Does that mean I won’t like older Laphroaig expressions? After all, and I’m painting in broad strokes here, the peat component tends to calm down the older a whisky becomes. Not necessarily. I generally find that well made whiskies full of character like Laphroaig age well, and their bold nature is refined as the years pass by. This is certainly true of the 2016 bottling of Laphroaig 30 year, as you’ll read in my tasting notes below. According to press material, this limited edition bottling had a “double maturation in first and second-fill ex-bourbon casks.” It’s bottled at 53.5% abv and retails for $1000. 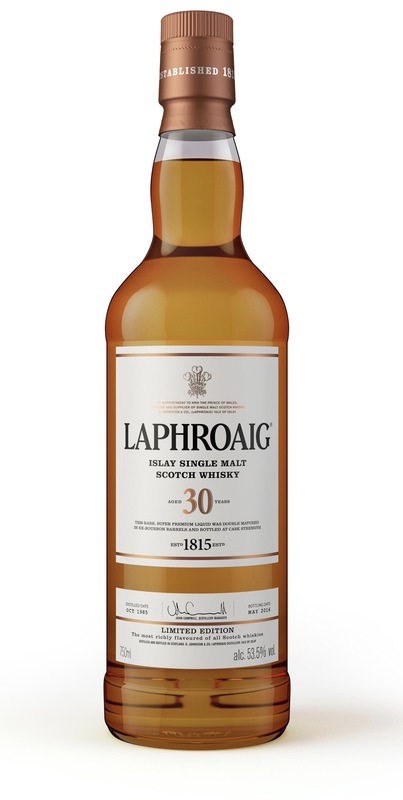 So, what does a 30-year-old, bourbon barrel-matured Laphroaig taste like? A refined nose of vanilla creme brûlée overwhelms at first. Once it settles in the glass, wood spice and ripe mango emerge alongside hints of earthy mushroom, briny peat, and orange. A soft entry for such a high proof 30 year old whisky. Lots going on here: dark toffee, freshly grated ginger, orange, and vanilla hit the palate first, followed by seaweed, tobacco and a whisp of lingering peat smoke. Some oak-driven baking spices hit the back palate, as well as a touch of astringency. The finish is long and a little warm, with orange candy, herbs and old oak. It wouldn’t want to be anything less than 9.5/10 for $1,000! Did you get a full bottle or a sample? They sent over a small sample. I treasured every drop.